More than most artists, Peter Gabriel has managed to incorporate a strong visual element in his live performances to match his groundbreaking music. 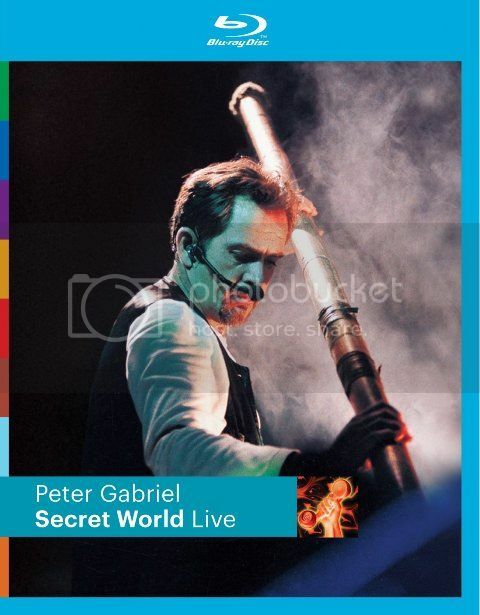 While on the Secret World Tour in support of his album Us, Gabriel released a live album and concert film entitled Peter Gabriel - Secret World Live. The film has been newly remixed, remastered and restored and is appearing on Blu-ray for the first time. The show opens in dramatic fashion. The crowd illuminates the air with their lighters while the sound of a telephone ringing is heard. Gabriel appears in a phone booth (dating the concert) on the “phone” singing “Come Talk To Me” while the band rises from the stage. A then unknown Paula Cole duets with Gabriel on the rousing track with Gabriel pulling the phone cord to get closer to her, only to be pulled back into the booth. Another Us track, “Steam,” follows the dramatic opener. Gabriel plays keytar on the horn-driven, funk-oriented tune as images of steam engines appear on the screen. Bassist Tony Levin really propels the song, which fits nicely into the “Big Time” and “Sledgehammer” mold. Gabriel is noted for his interest in world music and that shows up in the African-influenced “Shaking The Tree,” which features the band’s vocalists circling the stage. Another track, “Across the River,” has a longing call-and-response- between Gabriel and violinist Shankar, during the extended keyboard and violin intro. The second half of the show is devoted to the hits, and there are many. The band launches into a joyous version of “Solsbury Hill,” with the crowd joining in on the “Boom, boom, boom” refrain while “Sledgehammer” has a faster tempo and a harder edge than its studio counterpart and Gabriel duetting with Cole on the second verse, adding an extra dimension to the song. The band emerges from a dome on stage for an inspired version of the show-ending “In Your Eyes.” Both the crowd and the musicians are into it for one of Gabriel’s best-loved tracks. The concert has been restored from the original 16mm film and looks fantastic. Similarly, the remixed and remastered audio sounds great as well. The Blu-ray is in 1080i High Definition Widescreen 16:9 and includes DTS HD Master Audio and LPCM Stereo. Bonus features include footage of “Red Rain,” as well as a documentary about the making of the film. As an artist, Peter Gabriel has always pushed the envelope, not only with his music, but visually as well. Peter Gabriel – Secret World Live finds the artist still in his hit-making heyday and delivering concert worthy of the material being performed. With the show looking and sounding better than ever, it is a must for Gabriel fans.